Hurricane stands out in the Egyptian Red Sea - and not just because she is one of the few steel hulled vessels. Many Red Sea liveaboards are compared to Hurricane, but few are as enduringly popular. She has won the prestigious "Liveaboard of the Year" award no less than 5 times (including 2017 & 2016). 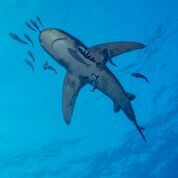 This is a testament to the superb crew and guides on board that make diving the southern Red Sea such a pleasure. This is no mean feat and can only be achieved with a vast amount of hard work all around. At 36m there is bags of space on board Hurricane. There are 11 cabins in total spilt over the main and lower deck. The 4 main deck cabins are a mix of twin or double beds (with an additional single bed). The lower deck cabins are all twins apart from the bow cabins, which have a double bed and additional single bed. Cabins are allocated at the time of booking so do ask your travel consultant if you have a specific request. All have individual air con and en suite bathrooms. 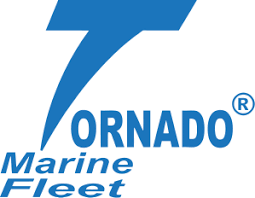 You will instantly recognise what has become the Tornado Marine Fleet signature design.The dining and saloon areas are separate. Meals are served buffet style in the main deck dining area. Upstairs opens up into the saloon with the bar, TV and seating area. 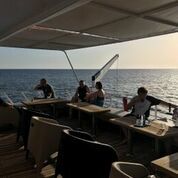 Outside there is a seated deck (ideal for your post dive tales), the upper sun deck and loungers. 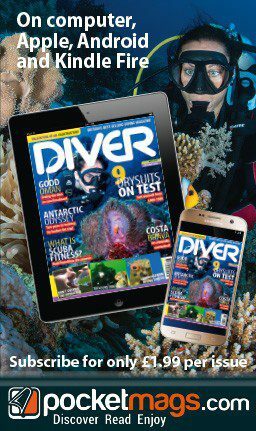 Down on the dive deck extras include an air gun for cameras, high pressure gas bending facilities (please prebook), nitrox compressor and gear storage. The low dive platform makes entry and exits easy. With longer journeys and more open seas in the southern Red Sea, Hurricane works hard and from time to time, this is reflected in the exterior of a steel hulled vessel. 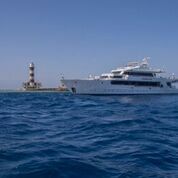 But her superb design means that beneath this cosmetic wear and tear, you are on board one of the most stable liveaboards in the Egypt, with a Captain that has been at her helm for years. Hurricane under goes a major refit each winter.